The Schwinn Air Driver 700 4-in-1 bicycle pump uses an internal switch valve to automatically shift between needle-valve and bike-valve modes. The four functions include filling bike tires fitted with either Presta or Schrader valves, inflating sports equipment and pumping up auto tires with Dunlop valves by using a brass conversion fitting. Occasional problems with sticky internal parts confuse many owners, but a simple fix usually puts the pump right again. Remove the plastic cap from the valve stem on the bike tire. Confirm the type of valve. Presta valves have a plunger tip held closed by a cylindrical threaded nut. Schrader valves have a plunger inside the valve opening that releases air when pressed. Unscrew the plunger nut on Presta valves to the top of the plunger. Turn the outer ring of the Schwinn 4-in-1 pump nozzle counterclockwise to remove the ring from the pump. Pull out the two pump fittings inside the nozzle -- one hard plastic ring and one rubberized valve fitting. Each face of the plastic ring fits a corresponding face on the valve fitting. One side of the valve fitting shows a cylindrical nozzle and the other a central plunger. Adapt the pump for Presta valves by inserting the cylindrical end of the rubberized fitting into the larger side of the hard ring. Place the assembly back in the pump nozzle, with the rubberized part entering first, and thread the outer ring back on the nozzle. Slip the pump nozzle over the Presta valve on the tire and raise the locking lever on the back of the pump. Grasp the pump handle at the bottom of the pump body and pull the handle all the way out. Depress the pump handle rapidly three times to properly seat the pump's internal valve. Pump the tire up, depress the locking lever and remove the pump from the valve stem. Remove the outer ring of the pump nozzle and both internal parts. Press the plunger side of the valve fitting into the smaller aperture of the hard plastic ring. Replace the nozzle assembly in the housing, rubberized part first, and replace the outer ring of the nozzle. Press the pump nozzle over the Schrader valve and lift the pump's locking lever. Pull the pump plunger out and pump three times in quick succession to seat the interval pump valve. Pump the tire to the desired pressure. Depress the locking lever and remove the pump from the tire's valve. Lift the pump's locking lever and remove the brass fitting from the socket beneath. Press the locking lever down again. Remove the pump nozzle's outer ring. Remove both internal fittings and set the rubberized section aside. Insert the smaller end of the brass fitting into the larger side of the hard ring. Insert the assembly into the nozzle with the hard ring entering first. Replace the outer ring of the pump nozzle and use the assembled nozzle to inflate either Presta valves or Dunlop tire valves. Turn the center portion of the pump nozzle to swing the inflation needle out of the socket in the pump body. Swing the needle out 180 degrees. Moisten the inflation needle and insert the needle into the rubber friction valve on the inflatable sports equipment. Pull the pump handle out and pump the item up to pressure. Remove the pump needle from the valve and rotate the needle back into the pump handle's slot. 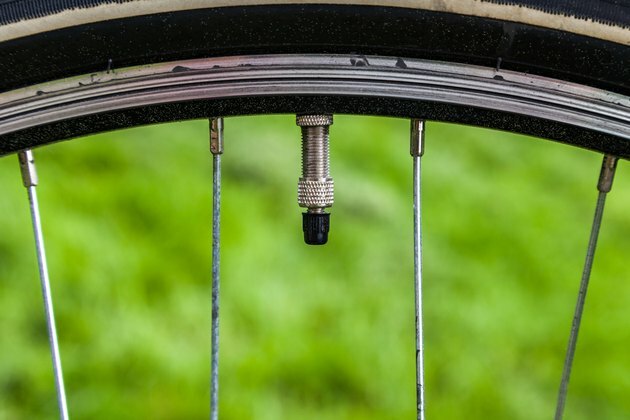 When Schwinn 4-in-1 pumps malfunction, air escapes when connected to tires or pumps out through the wrong nozzle. To correct this, switch to needle mode and use the back pressure of an inflated sports ball to seat the internal valve, according to Switchblade Nozzles' troubleshooting section. After inserting the needle, set the ball on a hard surface and press sharply down on the ball three times to free the valve. The small diameter and short stroke of this pump makes inflating a large item like a car tire time-consuming and difficult. Always thread the locking nut of a Presta valve back to its base before replacing the valve cap.